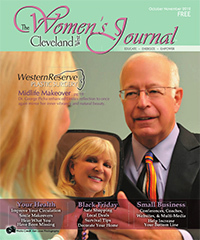 Are you looking for top plastic surgeons in Northeast Ohio? At Western Reserve, our talented cosmetic and reconstructive professionals provide Cleveland plastic surgery patients with access to high-quality procedures at our state-of-the-art facility. Dr. George Picha and Dr. Joyesh Raj take the approach that everybody holds their own inner beauty. It is the person who empowers it to come forward who is beautiful. Cosmetic surgery allows patients to take control of how they look, and become the beautiful person they’ve always wanted to be. Meet with our local plastic surgeons to learn more. Our philosophy is to make our plastic surgery patients feel informed, confident and in control of their plastic surgery experience. Our Mission Statement is to maintain a center of excellence in plastic surgery by informing and caring for our cosmetic surgery patients, focusing our attention on every detail both medically and aesthetically. featured in The Women's Journal. Certified by the American Board of Plastic Surgery, Drs. George Picha and Joyesh Raj are internationally recognized plastic surgeons who are considered experts at enhancing the appearance and confidence of people of all ages. Practicing cosmetic surgery in Cleveland and northeastern Ohio for over 20 years, Dr. Picha is the trusted name in implant design and evaluation. Currently, Dr. Picha is the Chairman of the Breast Implant Follow Up Study (BIFS) for the Allergan Corporation. Please take the time to tour our plastic surgery site and learn more about what Western Reserve Plastic Surgery and Dr. George Picha and Dr. Joyesh Raj can do to help you bring forward your beauty. Please, feel free to contact us for any further information or to schedule a consultation with a highly skilled Cleveland cosmetic surgery specialist. LifeSculpt is a revolutionary laser-powered body sculpting treatment that eliminates excess fat from the body while tightening the skin. Dr. Picha now offer this leading-edge procedure to all their patients.